Recently I had a discussion about waxes and emulsifiers. 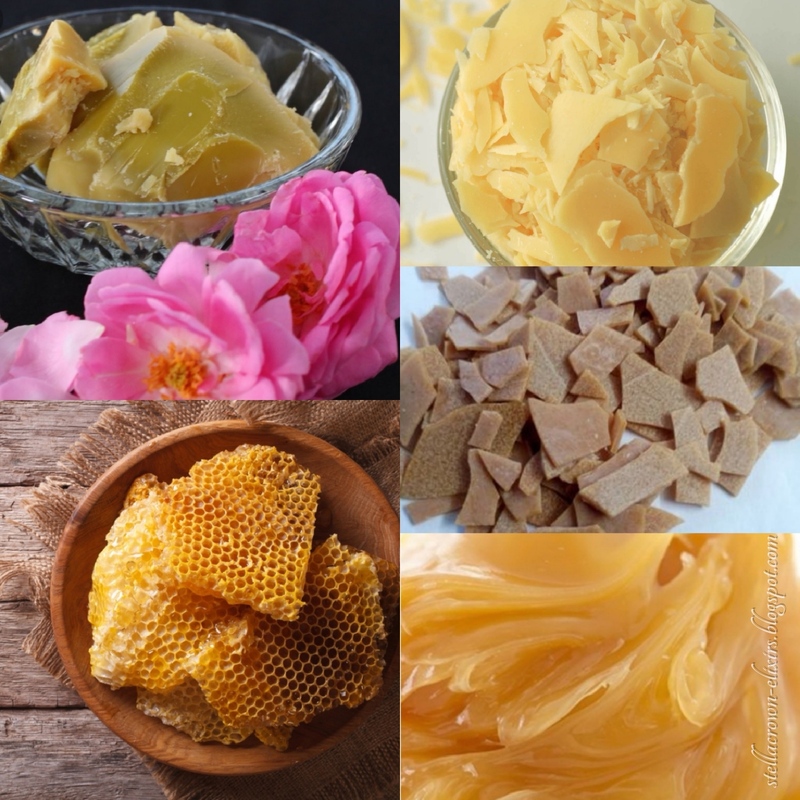 As you all have seen, there are several kinds of waxes about there which some of them we use to give structure and stability to our cosmetics. But let’s start from the basics: what is the definition of wax? Wax is a high melting organic ingredient which consists of unsaponifiable compounds such as hydrocarbons, alcohols and fatty acid esters. The most popular wax is beewax and its use has been known since antiquity. It is one of the oldest and most natural ingredients used in cosmetics and until today it is the first wax that most formulators choose to make their first balms and salves. It consists of 70% esters and 10% hydrocarbons and is a by-product of beekeeping. 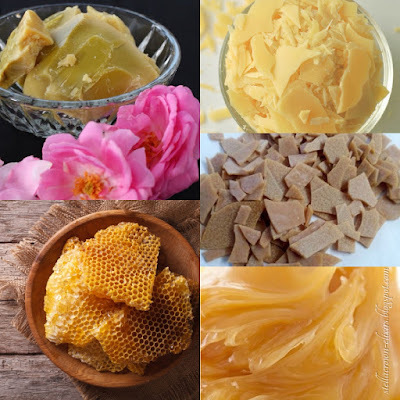 The raw material is heated at 630 C, causing the wax to melt and rise to the surface, where it is collected, cooled, hardened and further processed to be used in beekeeping again or in quality candles creation, cosmetics, agriculture, art and industry. It has antibiotic properties which make it capable of preserving honey, thus being used in medicine production. It offers healing, softening and anti- inflammatory properties to your skin, while boosting its elasticity. It creates a protective hydro- lipid film on the skin helping it maintain its moisture; therefore skin doesn’t get dehydrated. The melting point is 60 degrees Celsius. It is not considered as an emulsifier and does not give sufficient stability to emulsions but in combination with other waxes or emulsifiers we can add it to our products for its properties. Lanolin is a kind of wax with surprising properties derived from the processing of fat found in sheep wool. It is mistakenly referred to as animal fat, although it does not contain glycerides and is in fact a waxy substance that waterproofs the wool of sheep and protects it from adverse weather conditions. Lanolin works as an emulsifier as it absorbs twice its weight in water and with it we can replace the wax. This is because it contains hydrolipidic acids, various types of alcohols and hydrocarbons, and higher esters, and thus has water-holding capacity of preventing dehydration of the skin. Moisturizes and treats the skin with an action reaches up to 8 hours from the time it is applied. It is an excellent softening agent and is widely used in cosmetology. With the growing demand for cruelty free cosmetics, many of us have turned to other alternatives, such as plant waxes. Plant waxes are a blend of hydrocarbons and fatty esters derived from fruits, flowers and peels of various plants. They are divided into two categories: one concerns pseudo-waxes and the other concerns true vegetable waxes. The first time I read about rose and jasmine wax I was excited. But they are by-products and waste from the production of floral absolutes. In this category belong waxes such as rose, jasmine, mimosa, etc. On the other hand, we have the hydrogenated oils, where hydrogenation here is a chemical reaction aimed at increasing the melting point of the oil and solidifying it. The oils are usually refined, which means that the good elements of the oils are removed before the hydrogenation process is carried out. This category includes hemp wax, soy wax, olive wax, castor wax, etc. There are, however, waxes that are the result of blending vegetable oils with hydrogenated oils such as the almond wax that I recently found in a store, but in fact it is not even wax; as its INCI was saying "Prunus amygdalus dulcis oil & hydrogenated vegetable oil”: mixture of oils. The problem here has nothing to do with quality, of course, but with the price because all of the above are sold as overpriced waxes while in fact they are oils and extracts in a solid form. which are the real vegan waxes? It is derived from the leaves of a shrub in North Mexico which is called Euphorbia antisyphilitica. It is a substitute for beeswax, but they can even combined together. It contains 45% hydrocarbons and 20-30% fatty esters. Hard wax which melts at 70 degrees Celsius and is used to adjust the texture and the stability of a cream. It facilitates emulsification while it is ideal for chapped lips. It is made from sunflower oil and consists of saturated long chain esters that provide hardness and crystalline structure with a high melting point (75-80 degrees Celsius). It consists of 70% fatty esters and 30% hydrocarbons. Ideal for stabilizing water-in-oil emulsions. It comes from the leaves of the palm tree Copernicia cerifera that grows in Brazil. It is a hard wax that melts at 80-85 degrees of Celsius and consists mainly of fatty esters. It is low in hydrocarbons. It has a great protective capacity, ideal for sensitive skin and lips. It is used in lipsticks and lip balms to increase resistance to heat. I think it's one of the ingredients I do not like because of its bad smell, but it gives a nice texture to emulsions, balms and body butters. It is produced by hydrogenation of rice bran oil. For the end, I left you the best! Actually it is a liquid plant wax, as it consists of waxy esters and liquefies at room temperature. These are all the waxes I have tried. Lately, I combine them with each other, for example carnauba wax with beeswax, or in the latest experiment I mixed candellila wax with cetyl alcohol. Usually I choose the wax I will use αccording to the product I will make; if it’s summer and I want to make lip balm, I will use a high melting wax so my balm won’t melt into my bag. On the other hand, if I want to replace the beeswax (which its melting point is at 60 degrees Celsius) with a vegetable wax, I will choose a wax candle with a low melting point- in this case the candellia wax is closest. Which are your favourite waxes and why? Let me know!